Space Shifters is the latest exhibition at the Hayward Gallery in the Southbank. The exhibition explores a well curated collection of sculptural installations from a broad range of artists. The central theme of the exhibition focuses on works that challenge our visual perception of space. Consequently, most of the installations use materials that have reflective properties, the most notable of all being the Richard Wilson installation 20:50. 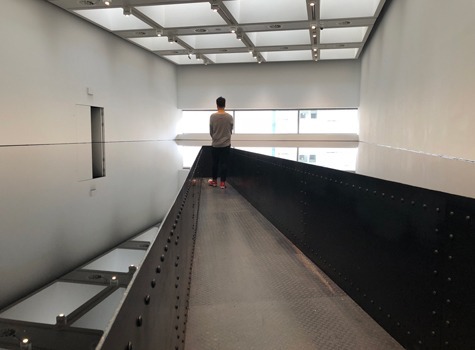 In this exhibit, a room of the Hayward Gallery is flooded in a vast pool of engine oil which is only intersected by a narrow black metal walkway allowing access for visitors into the centre of the oil filled room. When standing at the end of the walkway and peering down into the oil mirror you experience the dense smell of the oil and a seemingly endless dark reflection; peering into the void, an experience that sufficiently challenges one’s sense of reality to cause a moment of vertigo. Another defining piece for the LAPD team was the Acrylic Column by Robert Irwin. 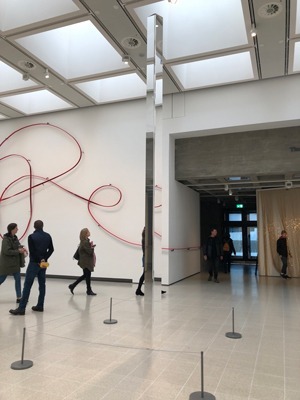 Standing at roughly 3.5meters high in the centre of the room, the column is a monolithic piece of cast acrylic with no visible flaws, as such it almost disappears within the room. It is an intangible object, appearing like a vertical knife cut through the room, light refracting through its surface is the only way visitors are made aware of its presence. Of course, this was Irwin’s intention, using materials that visually dissolve, with the aim of eliminating the object. One of the most dominating installations in the exhibition is 360° Illusion V by Keppie Hein. The piece consists of a large two-part rotating mirror, with each mirror set at 90 degrees from one another. The mirror pair project out from a central pivot point and an electric motor rotates the mirrors at a peacefully slow pace. As a viewer you can stand and watch or sit on one of the beanbags, allowing you to view the constantly evolving reflection of the space and yourself within it. 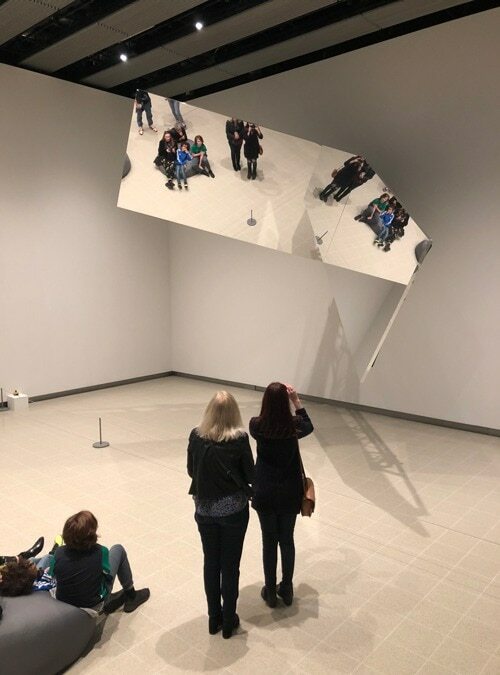 The brilliance of the installation is how it is so mesmerising, yet it is only showing you the space you are within from new angles framed by the mirror surfaces. In other installations we found ourselves challenged and disorientated, most significantly by Alicja Kwade’s Weltenlinie. Her installation left us confused and inspired at her precise play on reality and illusion. As a visitor you feel that you are a playing a part in this exhibition, there is interaction in the experience. It is both challenging and stimulating, and in these terms thoroughly recommendable. Space Shifters tickets are £16.50 and the exhibition closes on the 6th January 2019.